By Melissa 1 Comment - The content of this website often contains affiliate links and I may be compensated if you buy through those links (at no cost to you!). Learn more about how we make money. Last edited February 17, 2014 . “When discouraged some people will give up, give in or give out far too early. They blame their problems on difficult situations, unreasonable people or their own inabilities. I'm an Olympics junkie. I'm scared of heights, so it's with sweaty palms and bated breath that I watch Olympic events like snowboarding and ariel skiing. Because I can't ice skate more than two feet without falling in the most ungraceful manner, I love to watch figure skating–the men's, the women's and the couple's. I was watching the men's short program the other night when I saw U.S. figure skater, Jeremy Abbott, fall. Falls in figure skating aren't unusual, but this was a colossal fall. He fell hard on his hip and slid across the ice until he crashed into the side of the rink. He clutched his injured side and just lay on the ice, pain etched on his face. I, like most other viewers, I'm guessing, expected him to get up and leave the ice. After all, he couldn't recover from such a fall score-wise, and he was clearly hurting. I watched in amazement as he seemed to ponder what to do and then did the unthinkable. He got back up and began skating again even though he was probably a good 15 to 30 seconds behind his choreographed routine. He did all of his jumps and his routine flawlessly from that point on. 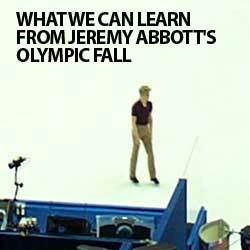 After the fall, Abbott said in an interview: “‘I wasn't going to let it go. I was like, ‘Not this time.' My personal story has always been about perseverance and always getting up when I fall,' said Abbott. ‘Maybe I'm not Olympic champion, but I can teach the world about that'” (ABC News). His lesson is an excellent one, especially when it comes to personal finance. Getting into debt, significant debt, is all too easy to do in our society. Unfortunately, once you're in debt, digging your way out is a slow, painful journey. Many people give up because it's just too hard. Better to stay in debt, make minimum monthly payments, and accept that this is the way life will always be. Even if you keep yourself out of debt, saving for retirement is a huge obstacle for most people. When expenses keep rising and fewer and fewer people are getting raises, just surviving without going into debt is enough for most people. Financial Samurai recently shared recommended 401(k) amounts by age, and my husband and I, while we have saved, aren't yet on the low end of retirement savings for our age according to the graph. Getting discouraged about personal finance is easy. Lying on the ground like Jeremy Abbott and wallowing in hurt is easy to do. Jeremy Abbott had no real reason to get up and skate in pain, but he did. He wanted to prove that he's not a quitter, and he can be proud of the rest of his performance. Whether you're 35 or even 55, it's not too late to right your finances. Even if you've been in debt all of your life, you can still get out. If you haven't saved for retirement, you probably won't be able to save as much as you should, just like Abbott was no longer a medal contender once he fell. But any amount you start saving now, no matter your age, will help make your retirement a little more comfortable. Have you wanted to give up financially? How do you encourage yourself to continue on? Last Edited: 17th February 2014 The content of biblemoneymatters.com is for general information purposes only and does not constitute professional advice. Visitors to biblemoneymatters.com should not act upon the content or information without first seeking appropriate professional advice. In accordance with the latest FTC guidelines, we declare that we have a financial relationship with every company mentioned on this site. I’m reminding of one of the climactic scenes in “Chariots of Fire” when Eric Liddell is knocked down during a race, gets back up and wins the race. He faced a moment of decision when he was knocked down, and he made the right choice. Our finances are sometimes going to knock us down but we must get back up.